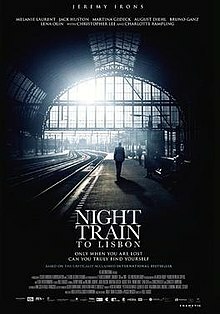 After rescuing a young woman from leaping from a bridge in a rain storm a professor finds himself on a train to Portugal where he tries to track down an author of a book written in response to the dictatorial takeover of the country. An excellent cast (Jeremy Irons,Tom Courtenay, Lena Olin, Bruno Ganz,Christopher Lee, Charlotte Rampling among others) makes this overly literary film worth trying. While there is enough drama to carry us from start to finish, the film, an adaption of a novel by Pascal Mercier, seems to be missing something to make it fully click. I kept wanting to know more about some motivations, such as why Irons would simply flee his class and run off as he does. I’m guessing the motivation in the novel was part of some interior monologue that has been lost in translation. To be honest I really do like the film, but I wanted to like it more. It’s kind of a really good film that just sort of misses being great. Reservations aside. Recommended.